My little #geartester practicing his casts. Me with my 23 inch, 6.75 lb brown trout. 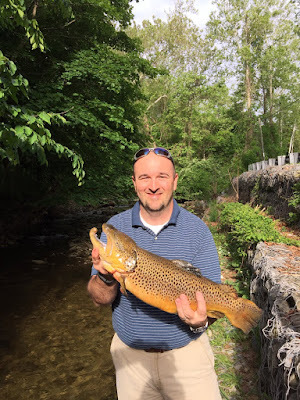 Last May I myself caught a pretty big fish (for a brown trout that is) and received a citation for just how large it was. 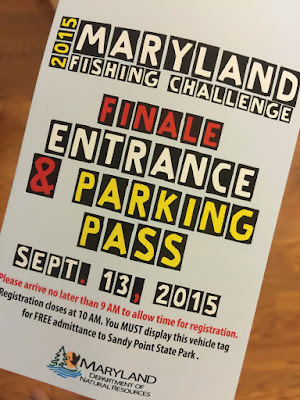 That citation was my ticket to the Maryland Fishing Challenge. This is a yearlong fishing challenge where entries can be earned for catching citation size fish or for catching invasive species. The challenge culminates with an awards ceremony and prize giveaway at the Maryland Seafood Festival. Needless to say I didn’t win anything but Ryley came away with a Costa del Mar cap and a new-found thirst to catch a big fish. We bantered back and forth about how it would be next to impossible for him to catch a big striped bass (by big I mean 50+ inches) because they just don’t come along every day. We discussed about how most men fish their entire lives for a chance at a striped bass that big but never get one. He looked a little discouraged and saddened at the realization that what he wanted to bad was unattainable. Being the Dad that I am I didn’t feel quite right after that talk either. So, cultivating the newfound friendship Ryley had made at the F&S photo shoot I decided to reach out to see if they could point us in the right direction. Turns out they could, and boy did they ever point us in the right direction! Ryley on the dock with Mark's boat. After a few emails back and forth I was put in touch with a New Jersey native and F&S writer Mark Modoski. It seems Mark knew of a place that carried some big fish that wasn’t too far from us. We would be fishing on a lake in northern NJ for muskellunge, aka muskie. Depending on what you read this fish has been called the fish of 1,000 casts or the fish of 10,000 casts. Suddenly after hearing how elusive these things were I wasn’t so sure we would be fairing any better than going after stripers. Mark was gracious enough to offer to personally take us out on his boat to go fishing for muskie since we hadn’t a clue about how to catch them. So off Ryley and I went last Fall to search for muskie, hoping against hope that he would just catch a fish. I honestly didn’t even care how big it was I just wanted him to hook a muskie and have some fun. The recipe for the day was to slowly make our way around the lake with Ryley casting a 6 inch swimbait while we trolled a live rainbow trout off the stern. Much to my surprise Ryley did astonishingly well with casting the heavy swimbait all day long. Ryley casting a 6-inch rainbow trout swimbait. Halfway through the morning Ryley actually had a muskie follow the swimbait right up next to the boat. A couple times around the lake and we also had a few hits on the live rainbows but nothing hooked up. Then around 1:00 it happened. As we rounded a corner of the lake the bobber went under and line started to peel off the reel. Ryley picked up the rod and could barely raise it off the gunnel. He struggled for a few minutes then much to our dismay the bobber came floating to the surface. Ryley was somewhat heartbroken until we all realized that the bobber had broken free of the line and the fish was still on! What ensued was a flurry of activity in trying to assist Ryley with holding the rod up off the gunnel and steering the muskie into the next. I think the look says it all. Finally after a few minutes Mark slipped the net into the water and landed the fish. He kept the pole of the net level with the gunnel so that the fish remained in the water while he removed the hook from its mouth. Mark was shaking and started smiling uncontrollably and finally admitted that it was the biggest muskie he had ever seen caught in New Jersey. When he pulled her out of the water to measure there was no denying that she was big. We quickly measured her at 53 inches! Ryley and Mark proceeded to pose for a few photos and released her back into the lake to fight another day. The fish was so big it earned Ryley (his first name is really Shawn) a NJ Skillful Angler Award. You can check out another article about Ryley's catch here. Mark Modoski and Ryley McCardell with their 53 inch muskie. So how’s that for a fish story?!? Never in a million years did I think, when I first contacted Mark, that Ryley would catch a muskie his first time out let alone a muskie of such caliber. 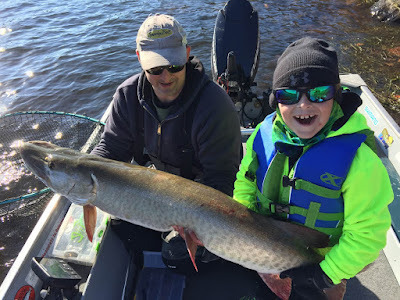 Grown men spend their whole lives chasing muskie and are satisfied with catching a fish in the upper 40’s and here my 9 yr old son catches a behemoth of a muskie on his first trip out. What are the odds?